Get HAZWOPER Hazard Recognition Safety Certification Online Now! Employing a worker at a job site involving hazardous waste or other potential physical or health hazards is a big decision for a company. Company owners and their insurers want to know that their workers have the appropriate level of knowledge and respect when it comes to assessing and handling toxic materials and other job-related hazards. 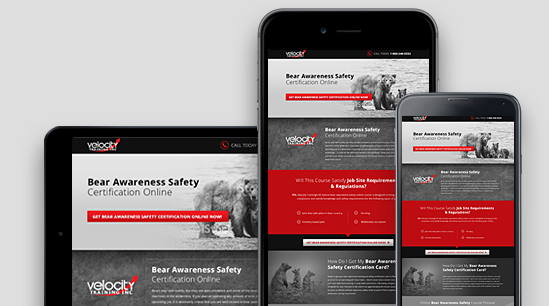 Boost your resume, earn your credential from the comfort of your own home, and prove to your next employer that you have what it takes to safely recognize and deal with hazards. Ready to get your HAZWOPER hazard recognition safety certification card in Alberta or any other province for an upcoming job? Good news — there’s never been a better time to take care of your HAZWOPER hazard recognition safety training in a way that’s convenient, interesting, and gets you ready and compliant for your next job! At the end of our approximately 90 minute course, you’ll simply print out your certificate and HAZWOPER hazard recognition safety ticket as proof of full completion of your hazard recognition safety training requirement. What are you waiting for? Take care of your HAZWOPER hazard recognition certification quickly and easily with a fun, engaging online course from Velocity Training!